Greetings! Although Blackwater Rollers haven’t had any home bouts lately, we’ve all still been very busy! Here’s a quick recap of what we’ve been up to…. 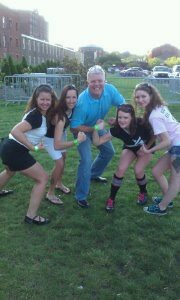 You may have seen quite a few of us at Friday Cheers in Lynchburg on June 15th. After 25 years, Beccanator finally learned how to do the electric slide. Better late than never! The next morning, we woke up bright and early for our Car Wash at Jiffy Lube in Forest. Thanks to everyone who stopped by to say hello, get their vehicle clean, meet the team and offer their support. 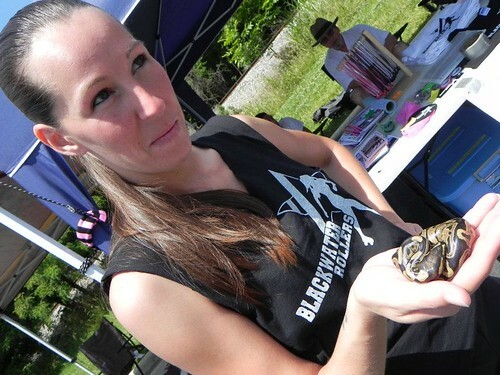 The most unusual event that day was a donation of a baby pet python, to Slim Jim and her husband, Stone Cold. June 23rd and 24th was an exciting derby weekend for many of us. Strawberry Kills Forever, Vamp Stamp, Beccanator, and our old friend Luv At First Fright (formerly known as Brawlin’ Chain/Sadie Masokissed) headed all the way up to Pennsylvania for the East Coast Derby Extravaganza (ECDX) in Feasterville. It was derby heaven! Not only did we have the miracle of not running out of gas on the Pennsylvania Turnpike at 1:30 am, we saw our local friends the River City Rollergirls bout the Central NY Allstars and the NH Skate Free or Die! 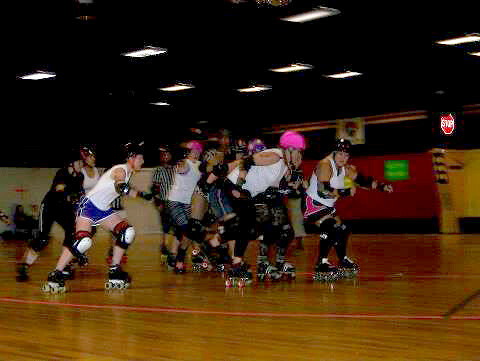 teams, and the Charlottesville Derby Dames take on the NJ Garden State Bruisers. The derby action lasted all weekend, and our heads were spinning from bouts on three tracks that included teams from all over North America – Gotham City’s All Stars and Wall Street Traitors, Montreal’s New Skids on the Block, Maine Roller Derby Port Authorities, the Hudson Valley Horrors, the Denver Mile High Club, Arizona Tent City Terrors, Boston Derby Dames, Philly Roller Girls Liberty Belles and Independence Dolls, Rose City Rollers, Toronto Roller Derby, Dominion Rollergirls (from Virginia Beach) and more! We also enjoyed some down time in the pool on site, and checked out the vendors from Bont Skates, Derby Skins, and Antik Skates founder/designer QuadZilla. Meanwhile, Slim Jim, Rykoshea, Stone Cold, Pizazz and company were tearing up another track – the go-cart track in parts of Pennsylvania that will remain un-named. Thank goodness Pizazz is a careful driver on the road….we heard she had the go-cart up on two wheels! Sunday, June 24th, we headed over to Hanover, PA to bout the Black Rose Rollers who you may remember seeing in Appomattox on March 10th. We had a lot of help from new derby friends, such as Debi Does Dulles, Loudon Dirty and Slammer Delaney of NOVA Roller Derby; Luna Kitty and Hatchetface from Mason Dixon Roller Vixens (Hagerstown, MD); Luv At First Fright (currently skating with Star City Rollergirls and Rocktown Rollers) and Spank Puncharella from Charlottesville Derby Dames. Our spirits were high as we worked hard to obtain a lead of 56 – 50 shortly before the first half. However, fates would not allow this to continue, as by the half time break we were 25 points behind and every single team member had 3 minor penalties (a 4th will land you in the box). At the end, we were devastated by our greatest loss ever (405 – 145), with all players having spent the entire second half in the box. Sometimes, all you can do is laugh, and our attitudes stayed positive for the afterparty. Black Rose did a heckuva job making homemade goodies to share, including pasta salad, truffles and….unicorn poop (rainbow twist swirl cookies with silver ball decorations, icing and candy hearts). The saddest part of this bout was saying goodbye to Strawberry Kills Forever, our beloved co-captain for the past year – this was her last bout as she is moving to California. We wish her the best in her tryouts for the Oakland, CA roller derby team, and hope to see her any time she’s on the East Coast! Congratulations to the MVPs and to Rykoshea and Slim Jim on a tough first bout, well played. July 15th, Rykoshea, DanYell, Meryl Shriek and Beccanator headed to the Mother State Roller Derby open house in Richmond. For those of you not familiar with Mother State, let us tell you, they take their derby very seriously. After 2 hours of heart-pounding, muscle-throbbing, grunt-inducing core and footwork exercises, we had an hour or more of scrimmage. It was an excellent lesson in stepping up our game, and believe us, we’ve been using some of the exercises we learned at practice to become stronger, steadier and better than ever! 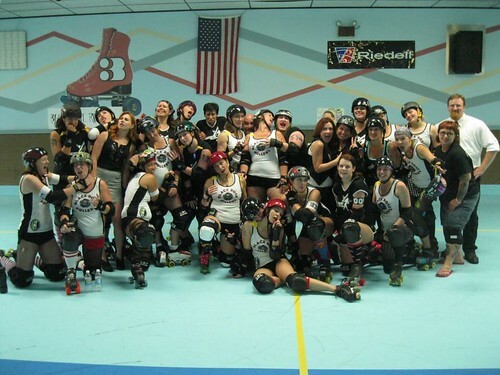 It was nice to get to know the Mother State ladies better, and also to see our friends from the James River Furies and East Coast Devastation Derby again. July 22nd, Diva von Tee Stop, Zombi, Turbosaurus Ref, Naughty Nini, Rykoshea, Slim Jim, Stone Cold, Hell-ga and Beccanator headed to Christiansburg to join the New River Valley Rollergirls for a mixer scrimmage that also included teams from Little City (Johnson City, TN), Charlotte Speed Demons (NC), Beckley Area Derby Dames (WV), and Jewel City (Huntington, WV). Alternating 30 minute periods of differing levels for 6 total scrimmages, we vote that our refs got the most work-out that day, although all of us played hard and went home sore and smiling. 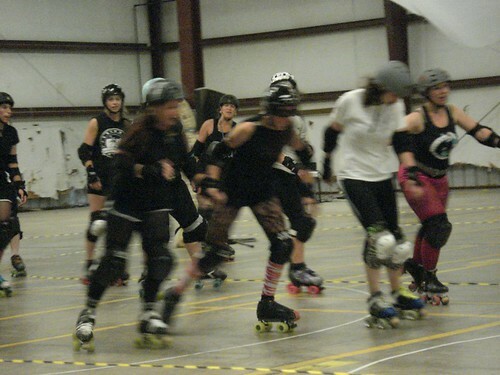 It is always fun to skate with derby friends old and new, and we particularly enjoyed the air conditioning and wood floor. In other news, we say a sad (but temporary) Ta-Ta-For-Now to Indy Rock, who is on leave of absence in preparation for her marriage to her soulmate (and one of the Best Bench Managers Ever) Gunslinger. We are extremely happy for this beautiful couple, and can’t wait to see them back next season! We also congratulate Mighty Mouse on expecting her second child, who we’ve fondly named Mini-Mini-Mouse. Another VIP who has stepped out of the derby limelight for now is our former President, Parabellum. We thank her for her dedication and leadership to BWR! We also say goodbye to former members Brooklyn BasHer and Guts-N-Glamour. In brighter news, we’d like to welcome our newest member, Jen Wilkerson. Jen is extremely dedicated, has a very positive attitude, and will surely be a power-hitter in no time. Don’t forget, we continue to have extended our recruitment period for the summer. On-skates or off, there is a place for you on the team. If you want to skate, we will teach you everything you need to know. If you just want to be a part of the team with a lower commitment, we always need help at our bouts for non-skating officials, graphics and design, raffle ticket sales, merchandise table, and more. Be sure to contact us blackwaterrollers@yahoo.com or on facebook if you are interested in becoming a part of our derby family. Stay tuned to hear more about the Blackwater Rollers latest adventures! ← From way back when…..